On the last full day of my Yorkshire Knitting Tour this July we visited Harewood House, an elegant Georgian stately home near Leeds. As a Jane Austen fan I love this house, which is the nearest place to me that could pass as Mr. Darcy’s estate of Pemberley. However, as with most (all?) Georgian wealth in the UK, the Lascelles family that built and own Harewood was involved in the slave trade, a history that stains the elegance displayed there. 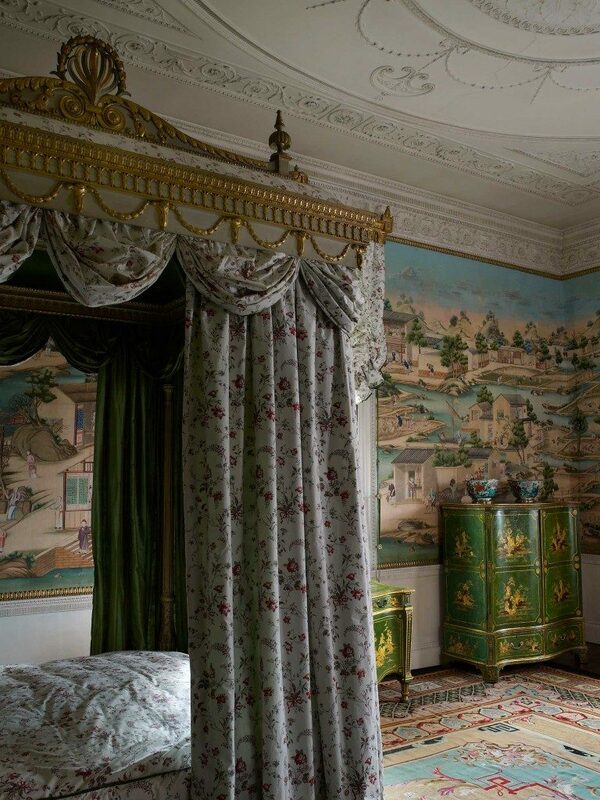 My favourite room at Harewood is the East bedroom, which now features some ‘Chinese wallpaper’ that was originally hung in one of the upper floor bedrooms under the direction of Chippendale, who designed much of the furnishingat Harewood. There is much detail in the paper, which depicts scenes of Chinese folk going about their daily business; cooking, farming, weaving, etc. After our visit to Harewood we travelled on to Baa Ram Ewe, Yorkshire’s premier yarn shop. They had a sale on, and much yarn was bought by the group, including some skeins of the now discontinued Dovestone DK that I bought to knit myself a Woodkirk cardigan. Alas, I’ve yet to cast on! Truly loved that last evening. On returning home to Cape Town. I made a point of looking up the words of Molly Metcalfe.